After declining throughout the second half of last year, the Conference Board of Canada's Leading Indicator of Industry Profitability has yet to show any real signs of improvement. 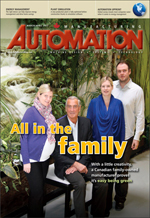 Does the manufacturing industry have a future in Canada? Click here to read what the Conference Board says. Statistics Canada says manufacturing sales declined 0.3 percent to $49.1 billion in February, following a decrease in January. Which sectors contributed to the drop? NextEra Energy Canada, the largest generator of wind and solar power in North America, has selected GE advanced wind turbine technology for six new wind farms in Ontario. Learn more. The Ontario government has launched its Clean Energy Economic Development Strategy with the goal of creating more jobs in the clean energy sector. What are the priority areas? Click here to find out. The Northern Alberta Institute of Technology (NAIT) and the city of Edmonton are collaborating on a solar energy research project that's evaluating the potential of the sun to produce green energy in Edmonton, one of the sunniest cities in Canada. Learn more. Skills/Compétences Canada, a not-for-profit organization that actively promotes careers in skilled trades and technologies, has announced that the United Association of Journeymen and Apprentices of the Plumbing and Pipefitting Industry (UA) has signed on as a Premier Sponsor of the 2012 Skills Canada National Competition. Learn more. Register to watch the FREE application video today and be entered to win an iPad2! Sustainable metalworking: Why aren't more manufacturers using minimum quantity lubrication? Metalworking operations have an obligation to develop sustainable manufacturing solutions. However, many manufacturers are still not taking the necessary steps to implement newer proven technologies that foster sustainability. Learn how minimum quantity lubrication can help. Learn how Guelph, Ont.-based Hammond Power Solutions is decreasing workplace accidents and increasing productivity in the testing of its transformers with the help of Omron's software-based safety controller and integrator Bellamy Electric. May 1: GE Intelligent Platforms Innovation Showcase - Mississauga, Ont. May 1-2: Partners in Prevention 2012 - Mississauga, Ont. May 2: GE Intelligent Platforms Innovation Showcase - Mississauga, Ont. May 8: GE Intelligent Platforms Innovation Showcase - Quebec City, Que. May 10: GE Intelligent Platforms Innovation Showcase - Montreal, Que. May 13-16: Skills Canada National Competition - Edmonton, Alta.